•	How do I introduce sprint training to people who are new to the activity? •	What volumes of sprint training are enough to develop or maintain speed qualities? •	Should I have my athletes pull sleds? If so, how far and how heavy should the sleds be? •	What kind of weight training program would make my athletes faster? •	Will use of electrical muscle stimulation enhance my sprint abilities? •	At what point in a rehabilitation process should I introduce sprinting? •	Will sprint training enhance my endurance capabilities? Now I could go on to answer all of these questions in great detail, but I do have a consulting business to run and I am also working on a comprehensive training manual that will address all of these questions. My goal is to outline the key progressions, volumes, mechanics and supportive elements in the most basic way possible, with broad application to all sports and all abilities. My interventions from youth sport, Special Olympics and all the way up to the NFL, NBA and Olympic level athletes have yielded exceptionally positive results. In many ways the answers are staring us right in the face. We just need to open our eyes and accept that simple solutions are all that are required. Short of giving away the farm, I can provide some insight into how sprint training can be the foundation of a training program because of the wide range of qualities that are required to become a good sprinter. In many cases, as I have alluded to previously, some of the simplest solutions can yield the broadest range of benefits. Think of two of the most highly touted recovery and performance solutions being promoted these days: sleep and drinking water. Go figure! How many of you needed a PhD in sport science to figure out that these are two of the most important elements of a training program? The same could be said of running. I truly believe that sprinting is the purest expression of “fight-or-flight”. Back in prehistoric and ancient times, prior to the domestication of horses, your ability to run fast determined whether or not you would live or die, whether you were chasing your dinner or being chased for dinner. For some reason, it is hard for many people to understand why sprinting is such an important cornerstone of a complete training program. Just like sleep and drinking water, many people do not sprint enough (or in many cases – they do not sprint at all) and find that their performance and resiliency suffers as a result. The excuses for not sprinting are weak at best. In most cases – like numerous simple tasks – people have no knowledge on how to implement a sound sprinting program. Others worry that they may get hurt doing sprint training on a regular basis. Even more laughable are the people that claim linear sprinting is not useful or “functional” for team sports because of the agility requirements of these sports. People – watch a goddamn sporting event! Guess what? Athletes, more often than not, sprint in straight lines whether it is soccer, basketball, football, rugby or baseball. Given that the shortest distance between two points is a straight line, I would say that sprinting linearly would be a good strategy. Even people in Track and Field are getting away from basic sprinting, looking for the Holy Grail of speed by dragging heavy sleds, pulling parachutes, running through ladders or bounding over short hurdles. And most people’s definition of quality sprinting is being diminished by the need to “keep moving” or “look busy” or “vomit between reps.” Why is almost everyone avoiding quality linear sprinting? Remember when people were always looking for super-foods? You know, all you need to eat is wheat-bran, acai berries, quinoa or kale. These foods will give you everything you need to have a perfect, healthy diet. Your hair will glow, your bones will be denser and you will be incredibly virile (which sounds too much like viral). The same search is always going on in exercise, with most of the solutions being tied to buying a specific product or piece of equipment, with less than stellar results. But what if I told you that you could follow a basic sprint program and get a multitude of results without selling your soul to the Devil? Figure 1 below is very telling in that it identifies opportunities for developing different performance qualities based on ground contact times and the specific running mechanics applied in that instance. In essence, almost every step from the start through acceleration to maximum velocity offers a slightly different training effect. Step 2 is very different from Step 6. While some people may want to clump all sprinting together as “one-dimensional linear sprinting,” those in the know will understand that the multitude of benefits to be derived from a single sprint effort. 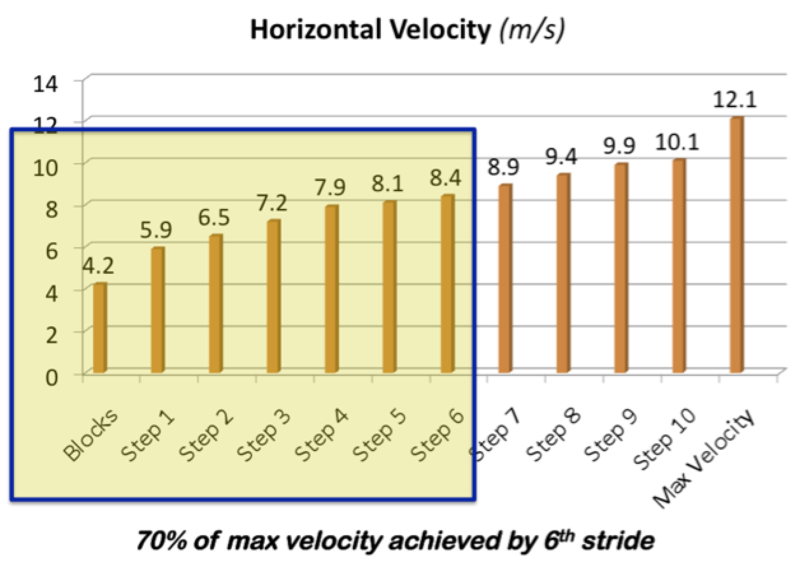 Even a single 10-meter sprint provide significant benefits, with an elite sprinter able to achieve a speed of 70% of max velocity by the sixth stride as indicated in Figure 2. The sixth stride is also very close to a ground contact time of one-tenth of a second, implying significant elastic power and a great deal of vertical force production. The initial push out of a start position requires significant strength capabilities. It is no surprise that most world-class weightlifters can get out of the starting blocks as effectively as the top 100m sprinters. If an athlete is performing sprints from a low, static-start position – whether from starting blocks or a three-point stance – the initial few strides will be performed with significant knee flexion on ground contact, working quadriceps, glutes and calves (see Figure 3). The initial push out of the start results in a ground-contact time of almost four-tenths of a second. This is equivalent to the time required to execute a vertical box jump or an explosive medicine ball throw. While these initial strides do not necessarily replace strength work in a weight room setting, repeat starts and accelerations can have a significant impact on both lower body and upper body strength abilities. Figure 3: Knee angles at various stages of acceleration. 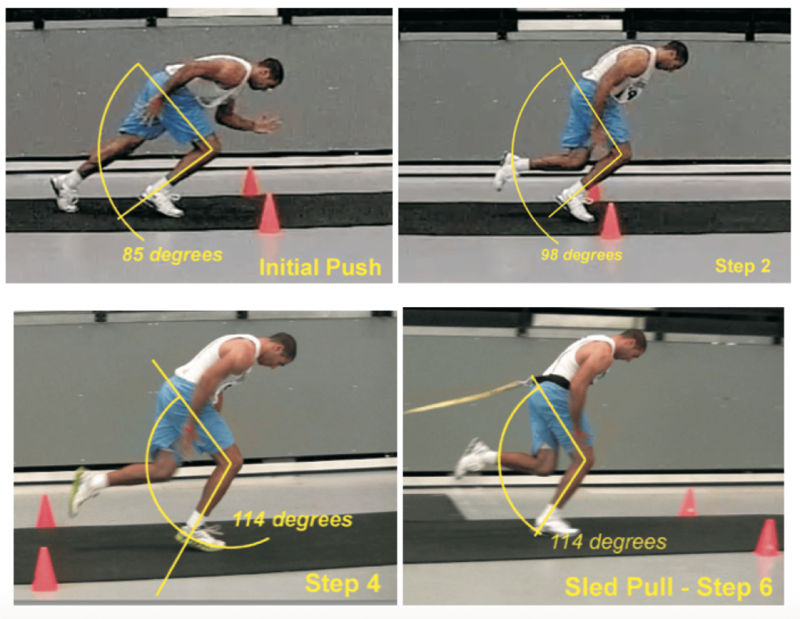 Note that weighted sled pulls allow for greater knee flexion further into the acceleration. Strides 1 through 4 will be very similar to the muscle action required for single-leg jumps such as a powerful take-off for a high jump or a long jump event. The ground contact time has to be long enough to provide the optimal production of both vertical and horizontal force with adequate knee flexion to involve the quadriceps and glutes for power production, as documented in Figure 3. Use of a weighted sled allows the athlete to hold acceleration posture further into the run effort, allowing for greater exposure to similar knee angles and ground contact times for power production. Elastic power plays a significant role in attaining higher speeds and maintaining speed in longer duration efforts. In the latter stages of the acceleration phase and into the maximum velocity phase, shorter ground contact times are made possible by the contribution of the hips and hamstrings creating significant downward force and high degrees of stiffness in the lower leg and foot complex. Minimal knee flexion on ground contact is desirable to maintain stiffness in the lower extremities. Without significant lower leg stiffness and elasticity, any force produced by the hip would be greatly dissipated with no significant energy fed back to the running stride cycle. That adaptations achieved through maximum velocity sprinting cannot be simulated through any other training method. 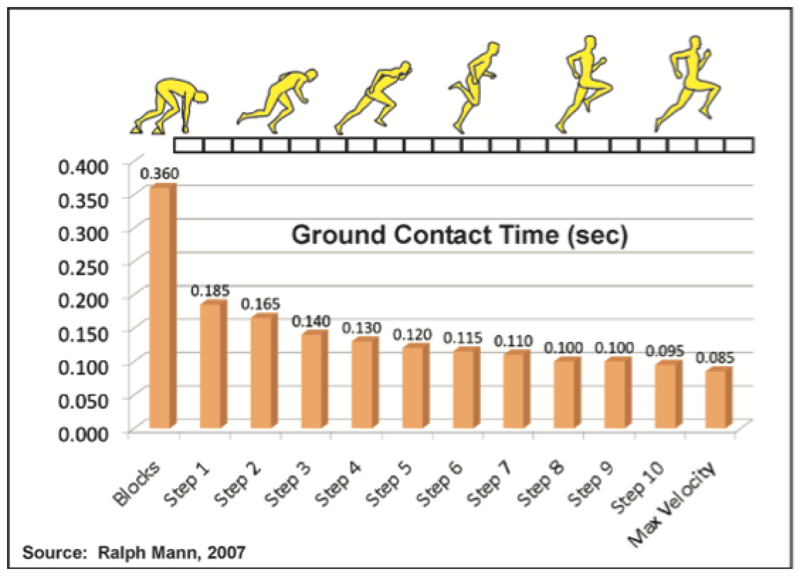 Ground contact times below one-tenth of a second with extremely high force production are unique to sprinting. Individuals who do not possess the skills to enhance an athlete’s linear speed qualities will often “poo-poo” the work of track coaches and linear speed advocates by saying that the key qualities in sports are agility and change of direction, and not linear speed. If I can improve an athlete’s linear sprinting abilities, I know that I have improved their strength, power and elastic performance abilities. These qualities readily transfer to agility and direction change movements, as evidenced by the fact that athletes have improved their agility test results when no formal agility training has been introduced. In many cases, the high volumes of sport-specific work done in practice sessions will more than satisfy the agility and change of direction requirements for an athlete. However, it is amazing how many coaches will not count that sport specific work as part of the daily training load. Layering on more supposedly “specific” agility work can only increase the wear-and-tear on an athlete and not improve force production and elastic qualities. At one of my recent presentations, I was asked how much time I spent exclusively on “deceleration” work. I had to point out to the individual that we are training deceleration all of the time. Every maximal sprint repetition must be followed by a deceleration phase. The athlete may not be “stopping on a dime” after each run (nor should they). However, the accumulation of eccentric load during the deceleration phase after each sprint repetition adds up to provide significant competence and ability in the realm of deceleration, with significantly less risk of injury. However counter-intuitive this may sound to people, high-intensity sprinting helps to protect athletes from soft-tissue injuries. Exposure to high stresses, both centrally and peripherally, in a progressive manner makes athletes more resilient to the demands of their sport. I have even used sprinting to train athletes in sports that don’t require sprinting for this very reason. Athletes who swim, bike, fight, tumble, ski and sit in a sailboat have all been given sprinting programs to develop their nervous system and strengthen their bodies. All have reported improved performance and minimal incidence of injury. In the case of athletes that do make a living off of running fast, sprinting in training has been proven to make them faster, minimize soft-tissue injury and, in cases where they have incurred an injury, assisted them in a speedy recovery. For hamstring rehabilitation, accelerations over 10 meters allow the athlete to train glutes, calves and quadriceps effectively, without excessive eccentric stress on the hamstrings. The accumulation of work over these relatively short distances not only maintains strength, power and speed qualities in the primary muscle groups, it also safely conditions the hamstrings for the demands of running fast. A smooth progression to longer acceleration distances ultimately acclimates the hamstrings for upright sprinting at maximum velocities. Sprinting is the cure, and naturally conditions the body for the demands of the activity. Special exercises, or training equipment, designed to individually strengthening component parts of the musculature will not address the issue as comprehensively or as sustainably as sprinting. As I mentioned previously, sprinting can be described as one of the most pure expressions of “Fight or Flight”, albeit dispensed in a controlled, deliberate manner. The amount of neuromuscular coordination and input required for executing almost five strides per second at maximum effort is unmatched in the field of exercise and performance. Seeing that we are wired to throw a maximum amount of resources into an activity that would save our lives (i.e. running away from a predator), you can see how it is an ideal means of positively stressing our nervous system. When implemented with optimal recovery times, moderate volumes and reasonably efficient technique, significant benefits can be accrued by athletes of any level of performance. And, as mentioned previously, the transfer provided by such intense neuromuscular training can transfer to other abilities very readily. While sport scientists are trying to determine start times and windows of opportunity to implement weightlifting, plyometrics and other forms of training with young athletes, these athletes can be sprinting and making significant gains in several different areas. If you watch young children play, they are sprinting around playing tag and similar games at maximum intensity. Kids have no medium zone. They are either on or they are off. They are all signal with a minimum of noise (at least neural noise). Their nervous systems are extremely plastic and their ability to adapt is exceptional. Sprinting is part of their regular informal play patterns. However, when you place your child in organized sport, too much structure, lots of standing around, over-coaching and lowest-common-denominator conditioning bog down the sessions. I can guarantee you that most sport coaches are not creating an environment where high quality sprinting is being achieved. Numerous studies have identified the link between enhanced high-intensity abilities and improved economy in endurance oriented activities such as running, cycling and swimming. Improvements in sprinting ability create a “speed reserve” that allow athletes to perform for long durations at sub-maximal velocities. Speed-based athletes can benefit from improved endurance abilities by constantly improving their maximum velocity abilities, while endurance athletes can improve their performance by integrating smaller doses of sprint work into their training programs. As I told participants in a recent presentation, a Formula 1 racecar has to be designed to last for a 90-120 minute (190 mile race), but also produce 1000 horsepower, hit top speeds of over 200 miles per hour and accelerate from zero to 60 mph (100 km/h) in 1.7 seconds. All F1 cars can travel from zero up to 100 mph (160 km/h) and back to zero in five seconds. Athletes must also have exceptional high-intensity capabilities even though their game may last several hours. If you neglect these higher-intensity abilities and focus solely on endurance and conditioning, your athlete will have no business being on the field with faster, stronger and more powerful competitors. I tell all that will listen to build their training programs on a foundation of speed. Many people errantly believe that a base must be built from excessive conditioning or countless hours in the weight room. While these elements are all important, remember to take a look at the game for which you are preparing. Athletes are moving their bodies explosively and rapidly around the field or court. They are rarely lifting anyone or running continuously at moderate speeds. They are standing, walking or sprinting. At least the good ones are. So why wouldn’t you base your training program around these qualities, particularly if you believe in specificity of training? Once you have identified the mechanics, volumes, recoveries and progressions for sprint training, then you can begin to integrate supportive elements such as strength training, explosive training and endurance training and build around your base. Identify what is important and then bolster your program with secondary but supportive elements. Once you understand and buy into this concept, making appropriate choices for training on any given day becomes much easier. The next step is to determine how much volume needs to be applied throughout a given session and week. While it is not within the scope of this article (or my livelihood) to provide you with all the details on how to make this work for you, I would encourage you to err on the side of less initially and then slowly build on your successes. One good sprint gives you the opportunity to sprint another day, particularly if you are running for your life.